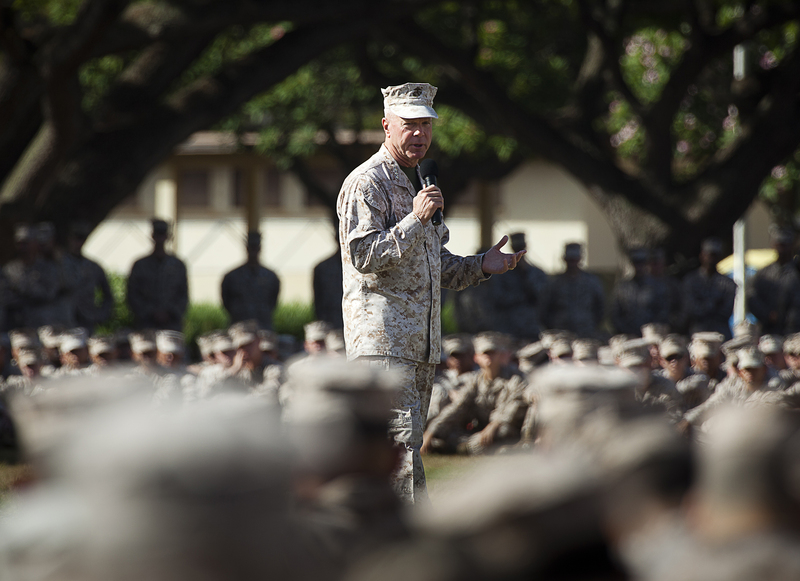 U.S. Marine Gen. James Amos, the 35th Commandant of the Marine Corps, speaks to Hawaii-based Marines and sailors during a visit to Marine Corps Base Hawaii, Aug. 3, 2012. During his visit, Amos answered questions and spoke about women serving in combat, the Corpsâ reduction in size due to the nearing end of combat operations, future deployments, uniform changes and the Corpsâ tattoo policy. Amos also presented Purple Heart Medals to Cpl. Matthew Gusty and Lance Cpl. Zachery Fisher, riflemen and fire team leaders with 3rd Platoon, India Company, 3rd Battalion, 3rd Marine Regiment. Both were injured in an improvised explosive device attack in Helmand province, Afghanistan, Feb. 19. Gusty, 26, is from North Versailles, Pa., and Fisher, 22, is from Roanoke, Va.